Available for sale by each bag or by the case. Please use the pull-down menu to make your selection. 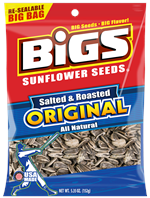 The Bigs Brothers are crazy about roasting great tasting sunflower seeds and nothing beats the simple goodness of Bigs Sunflower Seeds. That’s because only the biggest and best seeds are used. 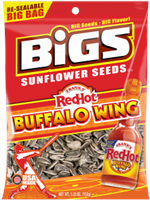 They are then flavored and fire roasted the bigs signature way. 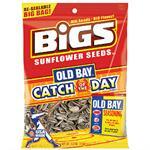 The seeds are always bigger, always better. Classic salted and roasted seeds are great and all, but sometimes you want something a little different without clobbering you over the head with spice. 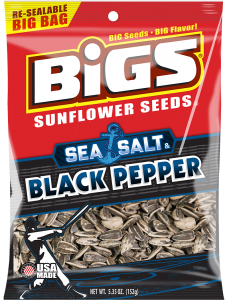 That’s where our Sea Salt and Black Pepper BIGS™ Seeds come in. 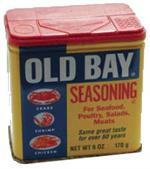 Real black peppercorns and the fresh, salty taste of the sea will definitely have you cracking a smile. 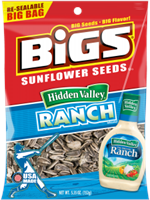 Jack's Country Store receives weekly shipments of Big's Sunflower Seeds, so you are ensured to get the freshest possible Big's Seeds!